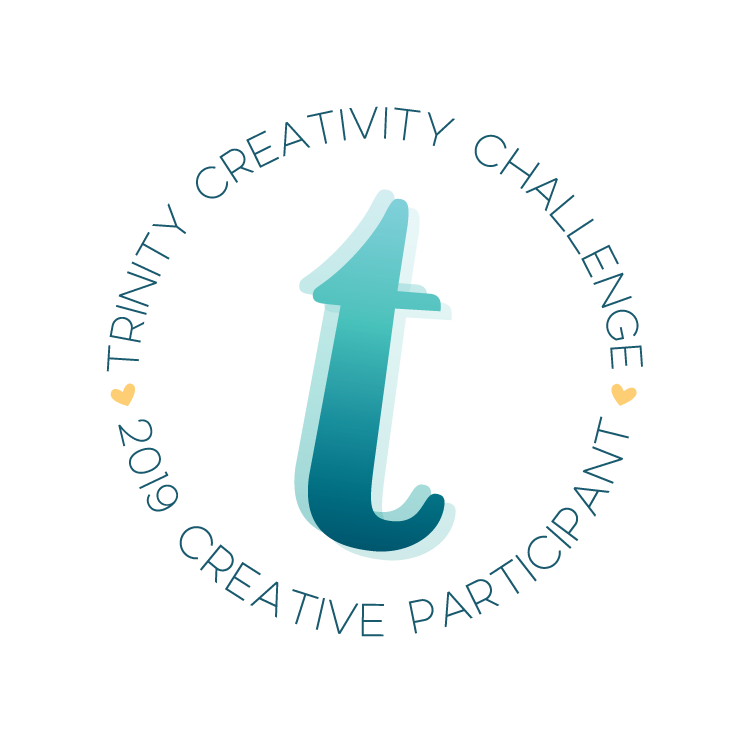 Hello, hello everyone and welcome to the Trinity Creativity Challenge! It’s the first Saturday of the month, which means a new challenge! 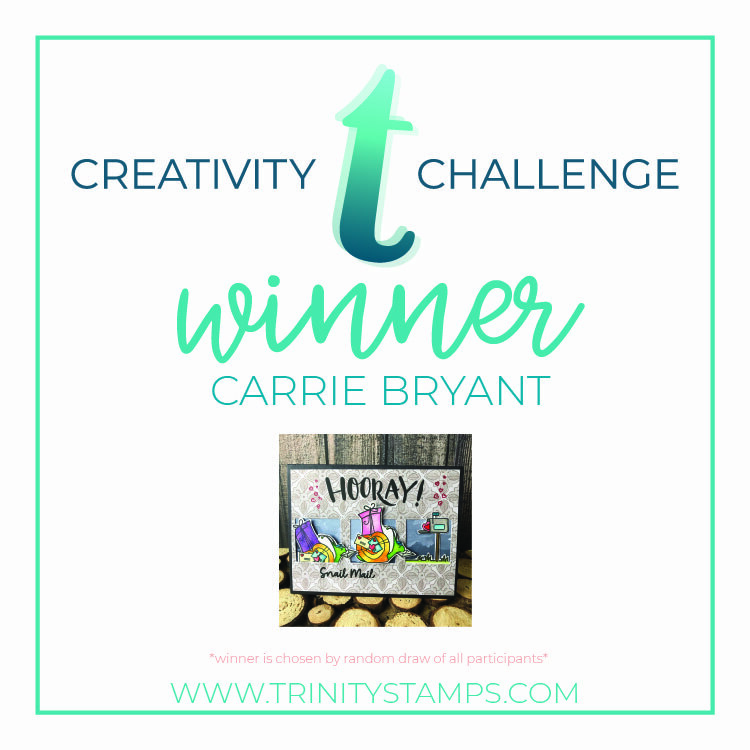 If this is your first time coming here, let me quickly introduce myself: I’m Erica and I’m your hostess for the Trinity Creativity Challenge! Before I go into details about this month, I’d like to take a moment to thank everyone who participated in our first ever challenge. Both here on the blog and on social media. I’t so fun to see how you are all interpreting the theme and what you come up with! Without further ado, let’s announce the winner of last months challenge! Congratulations Carrie! 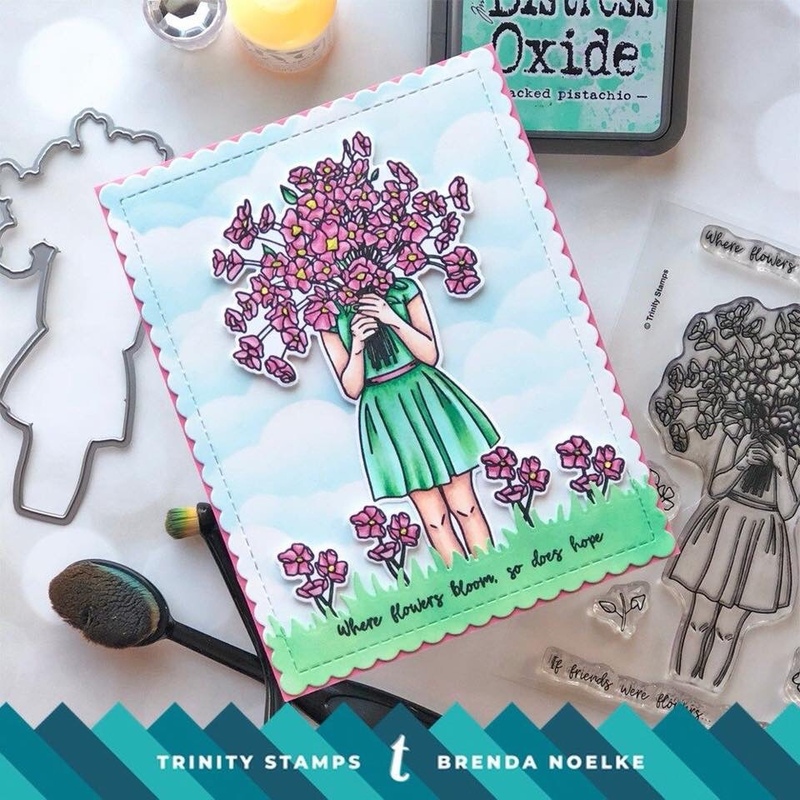 You have won a $10 gift certificate to the Trinity Stamps store and will be invited to be a guest designer for a future challenge! YAY! For those of you who participate in the challenge, feel free to grab this badge to use on your blogs and social media. 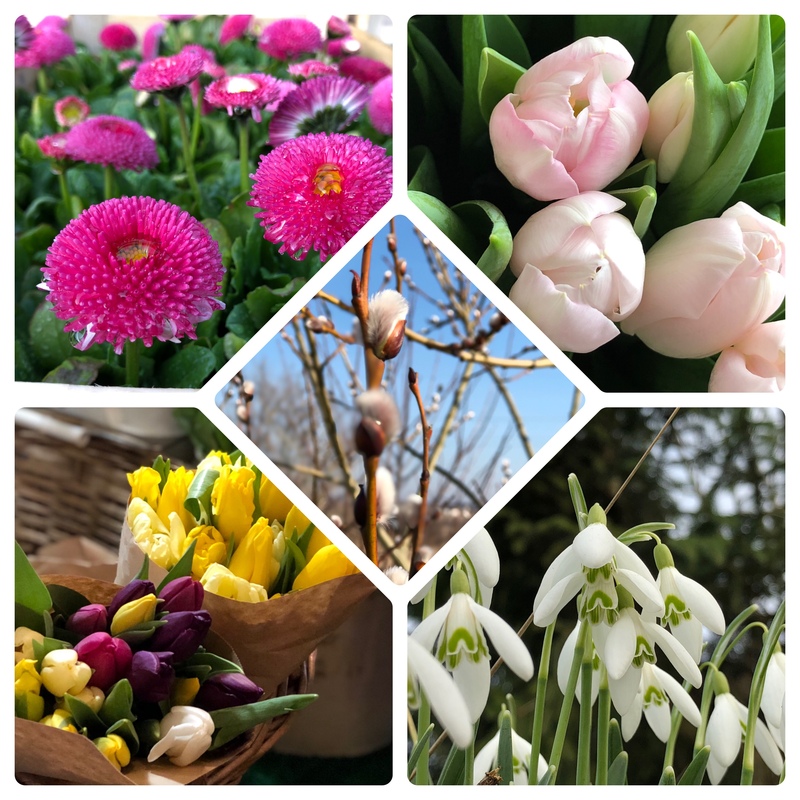 With that fun announcement out of the way, it’s time to get to April’s theme and for this month we have a very floral mood board. Will the colours, textures, shapes or something else inspire you? We can’t wait to see your creations. Make sure to read the rules and link up your projects with the InLinkz link at the bottom of this post so we can ooh and ahh over them. Our lovely DT Christine made this gorgeous card using Winter Botanicals and Succulent Banner sets. I love how classy it is with the white and gold. Stunning, Christine! 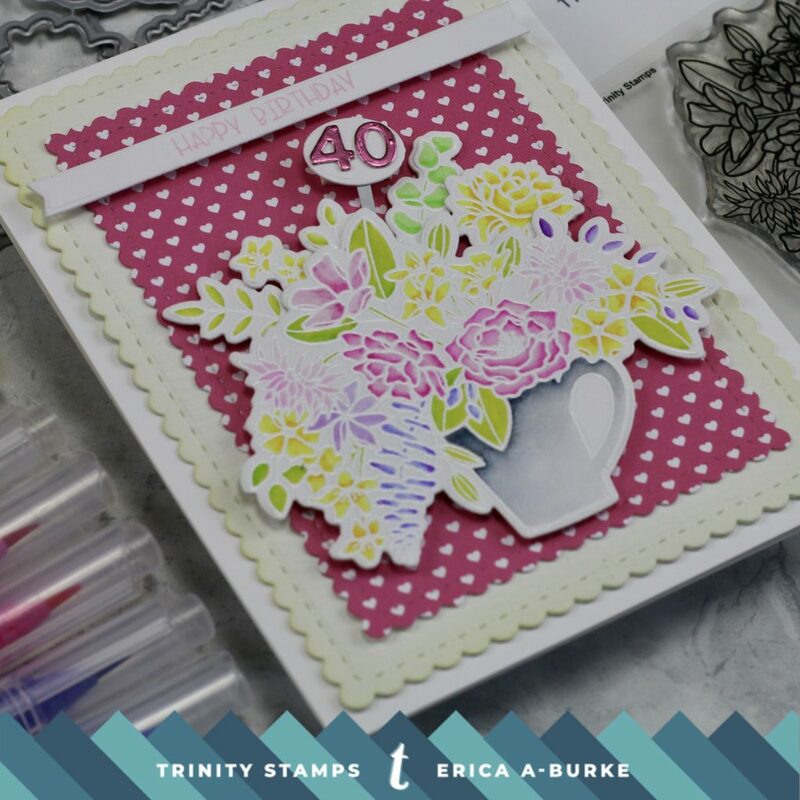 Our magician of a DT Katie created this gorgeous flower covered trellis card! All those little blooms surrounding the sentiment is simply perfection. 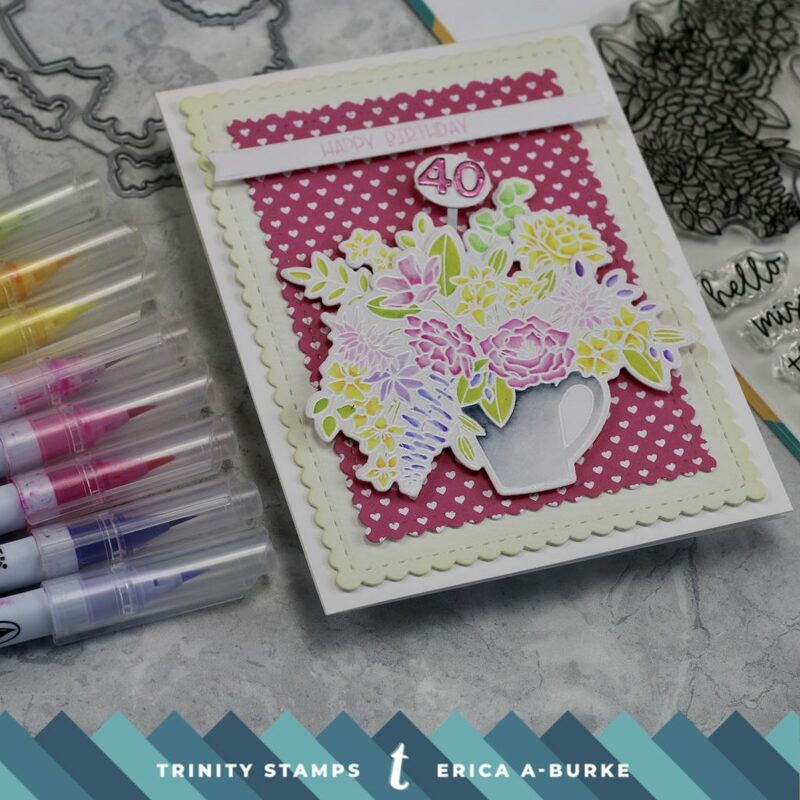 I was inspired by the spring flowers and the ‘blocky’ look of the mood board, so I decided to use layers and dimensions on my card. 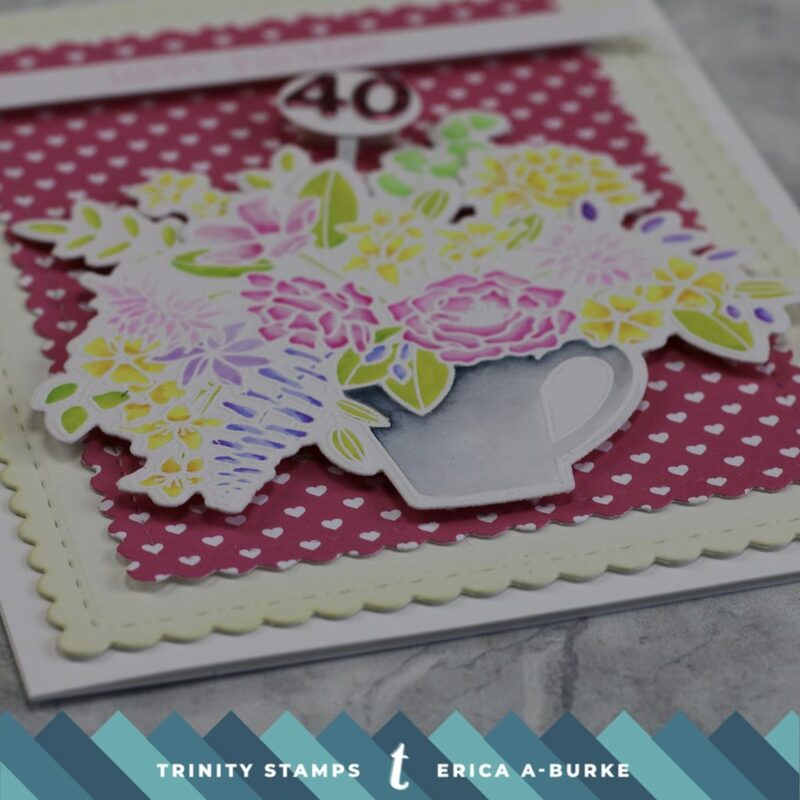 The focal point is the gorgeous watering can filled with flowers image in our Hello Sweet Friend stamp set. 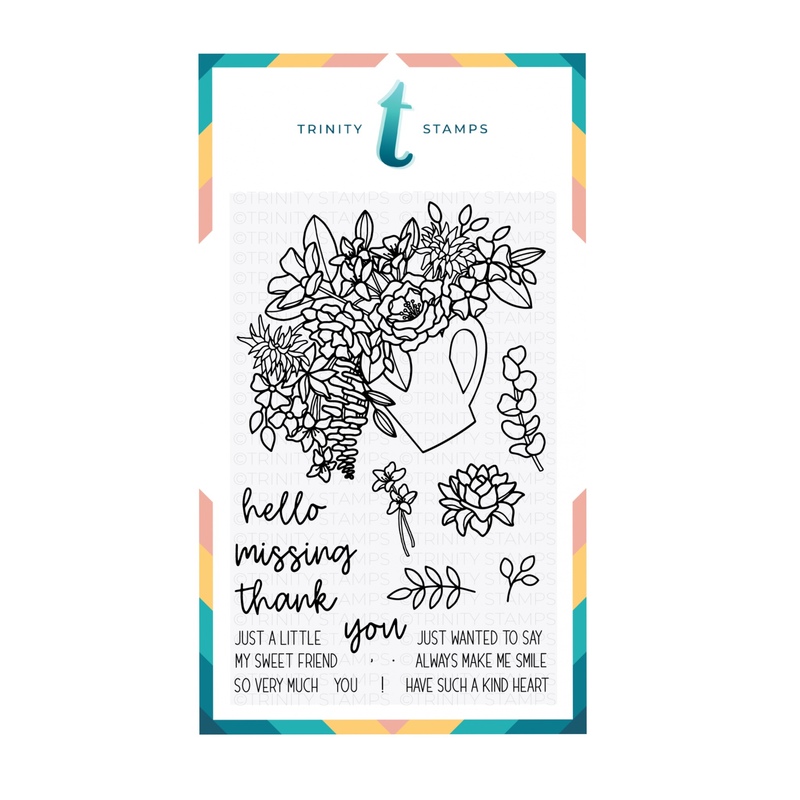 This, and all the extra flowers and leaves, were heatembossed with white embossing powder on Strathmore Bristol Vellum card stock. With a range of Zig Clean Color markers in pastel colours I coloured them all in. I have also used slightly darker shades to create some depth and details to the flowers and leaves. Thank goodness for coordinating diecuts, am I right?? I find that fussy cutting around heat embossed edges tend to crack them and it ends up looking tatty. I’m not a fan. 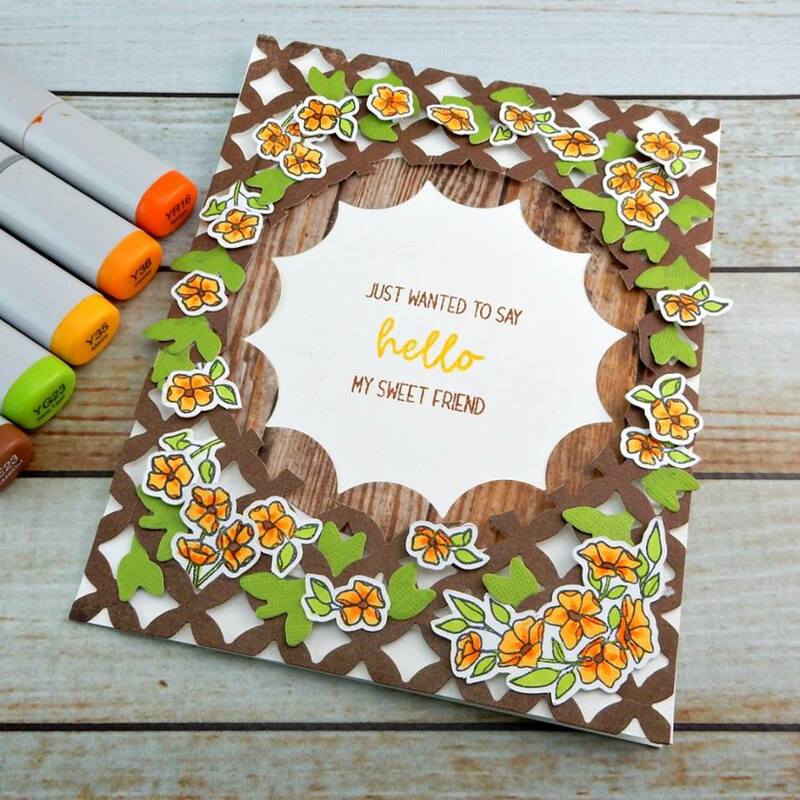 Using the Hello Sweet Friend coordinating dies, I cut out all the images. Then I played around with some placement before glueing the extra bits to the big image. I also added foam tape to the back of it to add some height. With the main focal point of the card ready, it was time to work on the background. I was inspired by the framing in the mood board photo and decided to use a white card base to ‘frame’ the flowers. I also layered this with two more pieces, in colours from the mood board, and then the floral arrangement would go on top. As a friend is turning 40 this weekend, I thought I’d make it a birthday card. On a slim banner I stamped ‘Happy birthday’ with Spun Sugar Distress Oxide ink. This banner has foam tape on the back too. I also made a ‘sign’ to go in the flower bunch, that has the number 40 on it. These numbers are cut out of matte pink mirror card stock and glued down. Around the scalloped edges of a diecut piece of water colour card stock, I gently added some Squeezed Lemonade Distress Oxide ink with a blender tool. The second diecut is cut out of fuchsia heart patterned paper. These were added to the card base with double sided tape. The birthday banner and the flower pot were then added and with that, the card was done! Now it’s your turn!! Go to town with colours and textures, or keep it simple and muted. We can’t wait to see everyone’s creations! Yay Carrie! Fun new challenge and great inspiration!